After the boom of 2017 and the beginning of 2018, the ICO market shows disappointment in traditional ICOs as a means of venture financing. A bearish market trend and a lack of new ideas to implement the blockchain in the traditional market, as well as the fact that investors became more experienced and prudent in their decisions are the main reasons for this. Also, the increase of regulatory activity, especially in the US and major European countries like the UK, Germany and France, has started a new class of fundraising on blockchain – security token offering, or STO. STO, as a mean of digital representation, refers to capital markets through issuance of regulated digital shares of equity or rights for profit sharing. Addressing the lack of transparency and regulation issues, STO could provide a smarter and more innovative approach to capital funding, attracting more of both private and institutional investors. Although there is currently no generally accepted regulation in terms of security token offering (STO) and digital assets, some regulators have already made some steps toward creating more favourable regulations for security tokens. Accordingly, it could be assumed that the interest in the STO, as an investment instrument, will be growing in the near future. ICORating’s analysts have released their quarterly report for Q3 2018, which is built on comprehensive analytical data and insights. The average funding attracted by the top 3 ICOs was $33 million. EOS still tops the list of ICOs in terms of funds raised in 2018, followed by Telegram. ICO organizers offered different types of crypto assets for sale with service tokens (49.05%) and utility tokens (25.3%) continuing to lead the way. The majority of projects were based in Europe (43%), which became the leader in terms of fundraising as well (48%, or $663 million). Asia showed a 65% decrease in funds raised and a 10% drop in the number of projects launched. 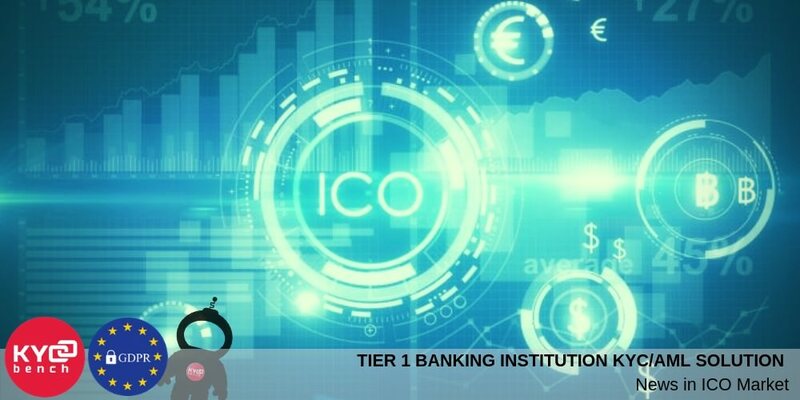 Taking into account the fact that the most popular industries by number of projects are energy & utilities, financial services and trading, while financial services, blockchain infrastructure and banking & payments were the industries where the largest funding amounts were raised, necessity and compliance with existing legislation and implication of Know Your Client (KYC) and Anti Money Laundering (AML) procedures is becoming a usual practice nowadays, where KYCBench, being GDPR and ISO 27001 compliant platform, is an ultimate solution for an outsourced KYC. Regardless to the ICO’s size KYCBench provides customized and tailored approach on KYC and AML checks, as the platform is designed to perform automated data processing, followed by manual checks, KYCBench also provide enhanced due-diligence reports, as there is another tendency, where ICOs are looking to raise capital mostly from professional investors, as there is less potential liability for the founders/directors in the future. It’s very crucial to keep eye on news because that’s the way it’s possible to achieve success or worthy results. IF we are UNABLE to track that down, then we are meant to struggle. So, that’s why we need to be alert to the news. I don’t exactly know about others but I am pretty much alert, and that’s easier with market follow up, and that works well for me through HKEX forecast, it’s amazing and helps big time. Which eventually leads into results I want and wish for.